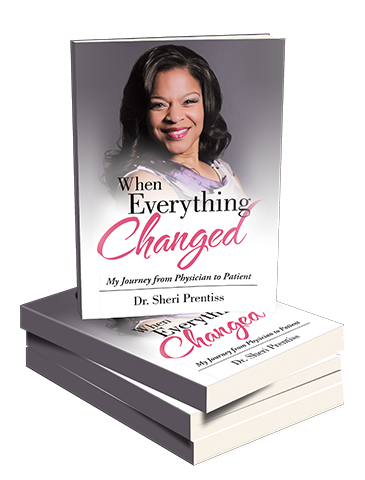 Quick witted, sparkly, and compassionate, Dr. Sheri lays bare the raw emotions of facing death in her new memoir When Everything Changed: My Journey from Physician to Patient. October 1, 2008 was WHEN EVERYTHING CHANGED. I didn’t get married, didn’t have a baby, and didn’t get a new job. I found a lump in my right breast. Normally, I would have run to tell my mother, but I was frozen by my discovery. I knew it was cancer from the moment I felt it, because no one knows my body better than I do. This gripping tale conveys Dr. Sheri confronting her frailty in one loss after another, climbing from self-examination to self-discovery, arriving face to face with herself, her power, and her God.